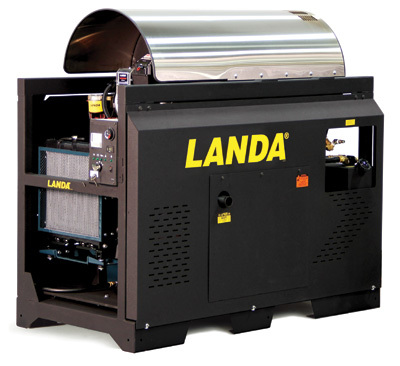 LANDA’s SLX, and smaller SLT, are the first power washers ever designed to deliver a high-volume flow at 200°F water, hot enough to melt the toughest of oily messes. Extra-large Heating Coil made of cold-rolled, 3/4″ Schedule 80 steel pipe with 5-year warranty; features Stainless Steel Top Wrap; unique lift-out design for easy and quick Coil Access. Rugged 2″ x 4″ x 1/8″ thick box steel frame, with compact footprint, shields key components; further protected by weather-resistant Epoxy Powder Coat finish; Power Platform is vibration isolated to minimize frame stress.